Kim Kardashian admits her fiance Kanye is "a hands-on father" to their eight-month-old daughter North, and insisted she doesn't mind that he isn't "a diaper kind of guy". Kim Kardashian says Kanye West is "a hands-on" father. The couple - who got engaged in October - welcomed their daughter North into the world eight months ago, and while the reality TV star revealed her rapper fiance isn't "a diaper kind of guy", he is a great dad. 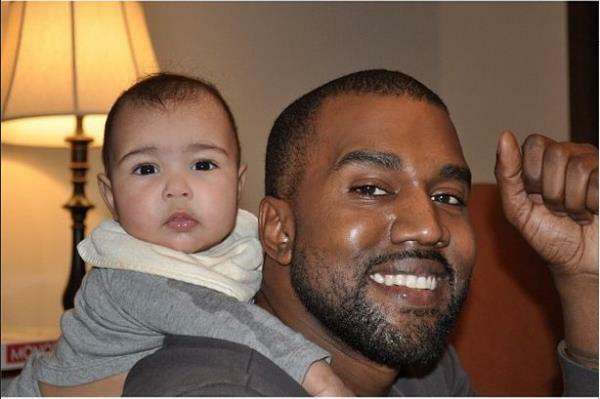 She told the Sunday Mirror newspaper's Notebook magazine: "Kanye is a hands-on dad. "But he's not a diaper kind of guy. And that's okay. But he would if it was an emergency." While Kim "had medical problems" during her pregnancy, she has found motherhood to be an "amazing" experience and she would love to expand her family. She said: "[It has been] amazing. But pregnancy was not a good experience for me ... I had medical problems. "But North is worth it, she changes all the time. One day she'll look like Kanye, the next like me. She is very calm and quiet. I want about six children." Meanwhile, the Keeping Up with the Kardashians star revealed her daughter has already begun to get an interest in fashion.